In a lecture to the Global Warming Policy Foundation, the former UK Environment Secretary Owen Paterson has criticised the current government’s climate and energy policies, suggesting there is too much emphasis on renewables and that the consequences of climate change have been exaggerated. A discussion of Mr Paterson’s comments on UK energy policy appears in another Grantham blog by Dr Simon Buckle. Here I will discuss one of the reasons for Paterson’s position, the belief that climate change has been exaggerated. If we look back to earlier attempts to quantify global warming, it is now becoming clear that while these attempts were not perfect, they were not hugely inaccurate either. Natural climate variation is more significant than global warming over shorter time periods, but about 25 years have now passed since the earliest attempts to produce policy-relevant projections of rate of warming, and subsequent publications have started to assess how accurate these projections were. In late 2013, the Intergovernmental Panel on Climate Change (IPCC), a body reporting to the UN, released the first volume of its Fifth Assessment Report. This volume contained an in-depth summary of scientific knowledge about climate science. Scientific understanding of the climate has come a long way since the IPCC released their First Assessment Report in 1990, but the basics of the greenhouse effect were well understood at the time. The projections of future temperature rise in the 1990 report represent the earliest attempt to produce a scientific consensus of opinion regarding the severity of global warming. A paper published in 2010 by Frame and Stone checked the projections in the First IPCC Report against observed temperature rise. Under the “business as usual” emissions scenario, the IPCC’s best estimate for the projected temperature increase between 1990 and 2010 was 0.55C, within a range of uncertainty. According to two different data sets, temperatures actually increased by 0.35C (HadCRUT3) or 0.39C (GISTEMP) during that period. This is just outside the broader range given by the IPCC, but the IPCC’s range was intended to reflect the uncertainty in the effects of greenhouse gases emissions on the long term warming trend. No attempt was made to include natural climate variability. Frame and Stone performed calculations to account for natural variability using two plausible methods. Both methods showed that the measured temperature increase is consistent with the IPCC’s projections when natural variability is taken into account. In addition, emissions have not been precisely the same as the trajectory used by IPCC, although on this timescale the difference is probably not very significant. Another early attempt to make policy-relevant projections was published by Hansen et al. in 1988, and results from this work were presented in testimony to the US congress in the same year. Analysis published in 2006 by Hansen et al. demonstrated that the 1988 calculations had been remarkably accurate, with the observed temperatures closely matching those projected under the most realistic emissions scenario. The exceptionally close agreement between the model projections and the observations may have been coincidental since the sensitivity of the climate to carbon dioxide in Hansen’s original model was near the top of the currently accepted range. Nevertheless, the temperature increases projected by the model were close to observations available in 2006. It is reassuring that these early projections have proved to be of the right magnitude even though the exact rate of warming wasn’t projected. It is worth bearing in mind that the original projections were made about 25 years ago, and the subsequent analysis referenced here was carried out in 2006 and 2010, meaning that only 18-20 years of data is used. This is still not long enough to iron out the full effects of natural variability. Nevertheless, it is now clear that the planet is warming and that humans are responsible, something that could not be concluded unequivocally from the evidence available 25 years ago. It is testament to this overwhelming evidence that those opposed to action on climate change now rely on relatively minor criticisms of climate science to form the basis of their opposition. Coming to Paterson’s second point, it is indeed true that there has been no significant increase in global surface temperatures in the 21st century so far. However, global warming is not expected to lead to a linear increase in surface temperatures. Indeed, the First Assessment Report of the IPCC, published in 1990, stated that “The [average global surface temperature] rise will not be steady because of the influence of other factors.” Other factors – notably solar cycles, volcanic eruptions and natural climate variation – are known to affect global surface temperatures. The lack of surface temperature increase this century is due to a combination of factors, but almost certainly there has been some contribution from natural changes in the amount of heat taken up by the ocean. It is important to note that the overall heat content of the planet continues to increase and this is still contributing to sea level rise and ice melt. Paterson continued, “I also note that the forecast effects of climate change have been consistently and widely exaggerated thus far. There is a hierarchy of uncertainty in climate change prediction. The increase in surface temperatures at a global level due to the greenhouse effect is well understood scientifically. The total amount of heat in the earth system is increasing due to greenhouse gas emissions, which is having the effect of melting ice and snow and warming the ocean, lower atmosphere and Earth surface. All of these impacts, along with ocean acidification from increasing atmospheric carbon dioxide concentrations, are almost certain to continue. Increasing temperatures will also have more complex dynamic effects, including on ocean currents and atmospheric circulation – key aspects of climate variability – as well as on weather patterns, including extreme weather. These impacts are generally harder to predict because there are more factors involved. Putting all of this together and trying to predict the effect of climate change on humans or ecosystems is even more complicated. The large scale Atlantic Ocean circulation, of which the Gulf Stream forms a part, is driven in part by processes in the North Atlantic that depend on the density of the water in the region. Polar ice melt and changing rainfall patterns due to climate change both have the effect of depositing relatively fresh (and therefore low density) water in the North Atlantic, meaning this process could be affected by climate change. The possibility of a complete shutdown of this North Atlantic circulation has been discussed based on the results of simplified models that show this as a possible outcome. However, mainstream scientific consensus has never been that that this is likely. Again, it is worth going back to older IPCC reports, which form the most comprehensive overview of the scientific understanding of climate change at the time they were written. At the time of the IPCC’s Second Assessment Report in 1995, the available models suggested that the ocean overturning circulation would weaken due to climate change. Subsequent reports in 2001 and 2007 also projected a slowdown and discussed the possibility of a shutdown, but neither report predicted a complete shutdown before 2100. By the time of the latest IPCC report in 2013, the overturning circulation was projected to weaken by between 11% and 34% by 2100. A slowdown has not yet been detected in the observations; this is likely due to the significant natural variability in the strength of the overturning circulation and the limited observational record. There is more than one way that climate change can affect hurricanes (or tropical cyclones more generally). Heavy rain is almost certainly becoming more frequent and intense globally, and this includes rain that falls during tropical cyclones. In addition there could be an effect on wind speeds or on the frequency of tropical cyclones. 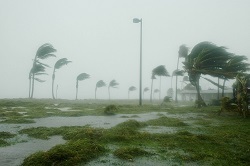 The IPCC’s Fifth Assessment Report reported observational evidence that the strongest tropical cyclones in the North Atlantic have become more intense and more frequent since the 1970s, although there is no evidence of a global trend. There has been a global decline in ice and snow due to climate change. Taking sea ice specifically, Arctic and Antarctic Sea Ice have different characteristics. The Arctic sea ice is more long lived and is declining in both area and mass. Antarctic sea ice is not declining in area because the ice is more mobile than in the Arctic meaning its characteristics are more complex. However since its thickness has not been accurately measured, it is not known whether it has gained or lost mass overall. Sea ice is not to be confused with the Greenland and Antarctic ice sheets, both of which are losing mass. This is discussed in more detail in a previous blog. Coming back to the hierarchy of uncertainty, changes in malaria incidence and the numbers of potential climate refugees are in the most uncertain group of impacts. These changes depend on the detailed changes in climate in the location under discussion and the response of humans or mosquitos/malarial parasites to that. A change in malaria incidence is still possible, but this remains the subject of research. As well as local climate conditions, the number of climate change refugees would also depend on the response from local people, governments or other organisations in adapting to the effects of climate change. The number of unknowns here makes it very difficult to predict how many people might be displaced by climate change, but this does not undermine our confidence in climate science itself.